Most teams might look at Ohio State's last two games and decide to air it out, with the Buckeyes ranking dead last in the FBS in pass defense. Rest assured, Army won't be one of those teams. A triple-option offense, the Black Knights have completed just two passes all season, both in their second game. 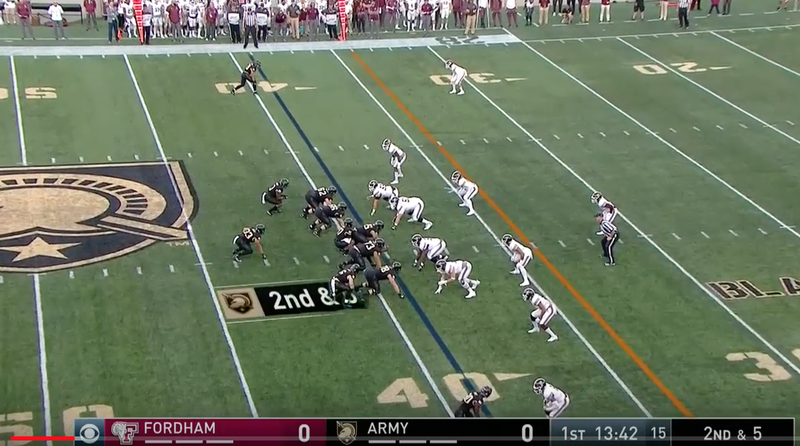 Army won its season opener against against Fordham without completing a single pass. There isn't much to dissect on a triple-option offense, but we are going to give it our best effort anyway. Shifty, mobile quarterback that is trained to take multiple hits per contest. Army's leading rusher with 34 carries for 324 yards and three scores. Not an experienced passer. In long yardage situations, Bradshaw is out of his element. Has just two completions for 17 yards this season. Woolfolk is Bradshaw's first option on almost every run play for Army. Woolfolk runs strong between the tackles, but will not be asked to run outside on most plays. Asberry, a Cincinnati Colerain product, has blazing speed on the edge. Army likes to run their speed option plays with him, mainly to the field. Trainor has battled injuries for most of his career. Despite his size, he is not afraid to throw a block in the trenches. Both Adams and Harrison have great size for their position. Both are relied on when Army runs on the perimeter for their ability to keep corners from making tackles. Not asked to do much in the passing game. Neither has a catch yet this season. Like most Black Knights, the offensive line is very disciplined. You will rarely, if ever see a missed assignment. Left side of the offensive line is undersized for the position. Overall analysis: With any triple-option offense, what you see is what you get. The Black Knights run through Bradshaw, who is a team captain, in addition to their leading rusher and passer. Bradshaw will read Ohio State's interior linemen first on most reads, then progress to the defensive ends and linebackers. Army has good size at receiver, but has completed just one pass for positive yards this season. This group is allowing less than 100 rushing yards per game up front so far this season at 92.50, ranking them 32nd in the country. Less than average pass rush. The Black Knights have just 5.0 sacks in two games against Fordham and Buffalo. Aukerman collected 7.5 sacks last season, and is the leader of the defense for the Black Knights. Brinson, like Oklahoma's JACK linebacker, will rush and drop into coverage at times. Washley and Christensen are largely inexperienced. Combined for just six tackles in 2016. England and McClinton are returning starters, and bring experience to the backend of the Cadet defense. McClinton is tied for the team lead in tackles, and is always around the football. He has Army's lone interception this season. Sharpe is tied for the team lead in tackles at corner. Anytime a corner leads the team in tackles, he is either getting beat in coverage, or the defense is not able to contain the outside run game. Overall analysis: Army, like most service academies runs the 3-4 because of its lack of large interior linemen. Their linebackers play well and are probably the strength of the defense. They constantly fly around to the football. Their secondary is young, but has playing experience. Analysis: The Black Knights have had four different players attempt an extra point this season, but Wilson has attempted the most of the four (7-of-7) and has been the only kicker to attempt a field goal (1-of-2). Schrage will handle punting and kickoff duties for Army. Schrage has struggled so far this season with his distance, averaging just 31.33 yards per boot.